This is so good, I’m not waiting until next Thanksgiving to do it again! I’m not a real big turkey eater. It’s not that I don’t like turkey because I do. It’s a nice protein with a very unique flavor. I love smoked turkey legs at the fair and always get one. 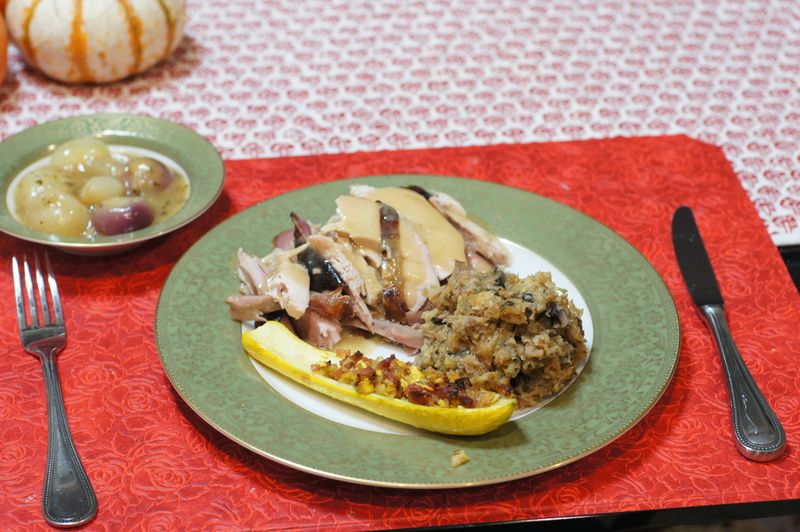 Insofar as cooking turkey, I make it once a year for Thanksgiving because it’s traditional. There is always leftover turkey that lasts for days and days and days. I eat more than my fair share of turkey in 1 week so I’m turkey satisfied and never want any more turkey until the following Thanksgiving. When all of the children were home, we would roast a 22 – 24 pound turkey with all of the fixins. It would last around a week and everyone would be tired of turkey. I’ve made turkey in so many different ways it’s amazing. In fact, I’ve lost count. This year, however, I tried a different brine and smoked a 10 pound turkey (It was either 10 lbs or 16+ lbs because they had nothing between 12 – 14 lbs). I have brined and smoked turkeys in the past and like them but this brine coupled with the pecan smoke was simply unbelievably delicious! It was sweet, savory and smokey, absolutely amazing. If you have a smoker, you have to try this dish. If you don’t have a smoker, go buy one because you have to try this dish. While this brined turkey would be very good roasted without being smoked, the smoke sets this bird apart from all others. It is simply over-the-top! But don’t trust me, try it for yourself. YOU WILL LIKE IT!!! 1 All-natural Turkey (12 – 14 pounds), without additives, broth, or other injected tenderizers or “seasonings.” Pre-basted turkeys like Butterball are completely out of the question. All-natural turkeys have been minimally processed and have no added ingredients. Under FDA labeling requirements, the label will say so. Put softened butter and herbs in food processor and process. Refrigerate until ready to use. Remove from refrigerator 30 minutes prior to use to allow butter to soften. 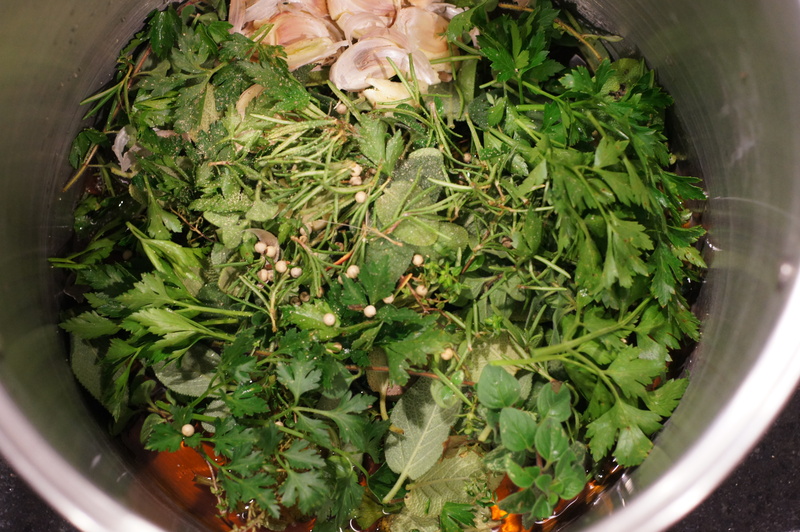 Add everything to a large pot and bring to a boil. Place turkey in a brining bag, cover with brine and place in a large bowl to ensure it doesn’t leak. When cooled, place turkey in the refrigerator and allow to brine 24 hours. 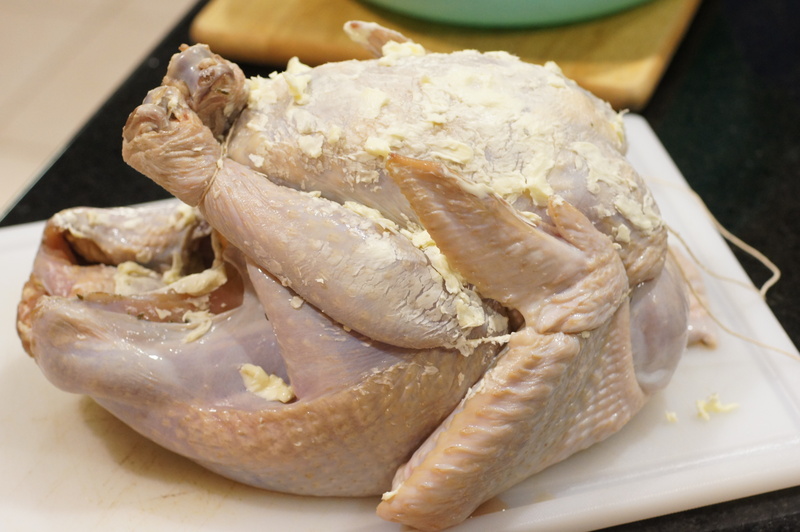 Remove from refrigerator after 24 hours and discard brine. Pat turkey dry, place back in refrigerator, uncovered overnight or another 24 hours. This is one way to help you get crisp skin. When you are ready to smoke the turkey, remove it from the refrigerator. Starting with the breast and working your way back to the wings, place your hand underneath the skin and on top of the flesh and carefully separate the skin from the meat. This is going to do 2 things. First, you are going to apply the rub between the skin and the meat. If you apply the rub to the skin you will simply flavor the skin. Second, this is another method to ensure you get crisp skin. Once you have loosened the skin, liberally apply the rub under the skin and on top of the meat. Any excess rub spread directly on top of the skin and truss turkey. Return Turkey to tub. 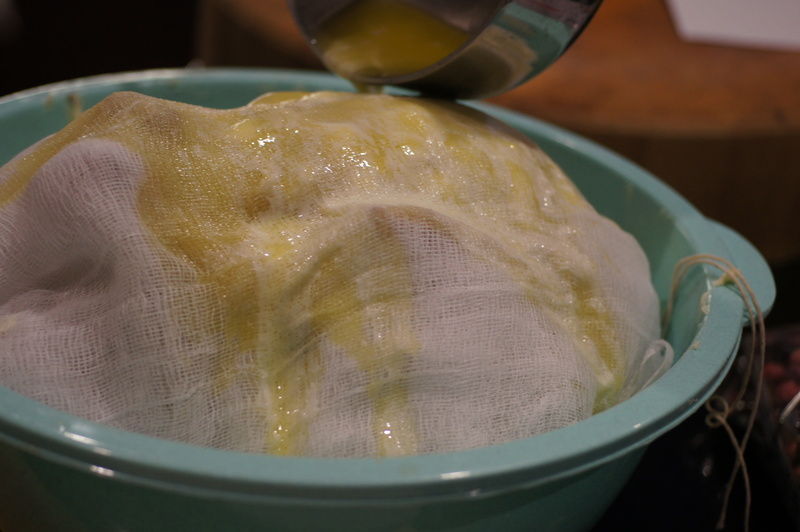 Cover with cheesecloth and drench cheesecloth with melted butter (3 sticks). The melted butter helps crisp the skin while also keeping the meat moist during smoking. The cheese cloth help keep the skin from becoming too brown. Keep cheesecloth on turkey until the last 45 – 60 minutes of smoking. Place the turkey in your smoker preheated to 275 – 300 F. If you smoke at a lower temperature, you will have a smokier turkey but the skin will be rubbery, not crisp. Smoke the turkey at 275 – 300 F for 15 – 18 minutes per pound, until the turkey registers 165 F on a meat thermometer in the thigh of the turkey. Remove turkey from smoker and let rest for 30 minutes prior to serving. Your turkey looks fantastic! Now I really wish I had a smoker so I could try this out. I hope you had a great Thanksgiving! You know I would love any post involving a smoker. 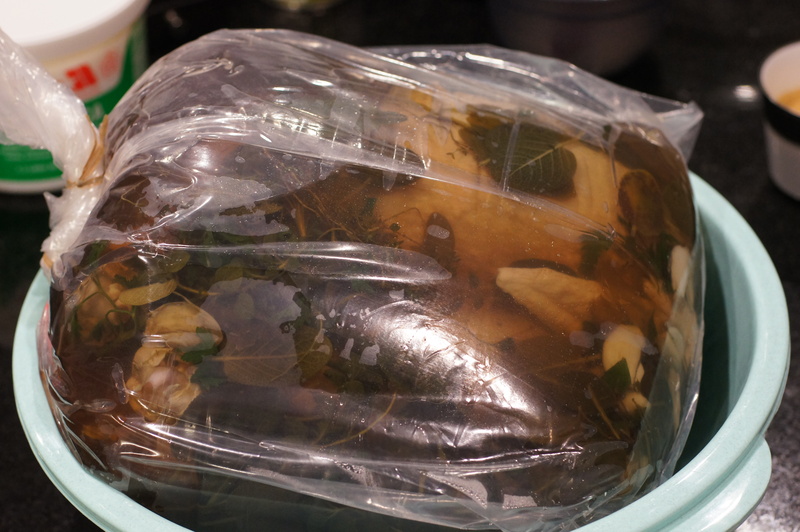 The brine sounds great and good tip on allowing it to air dry in the fridge overnight. Have you ever gone higher on the temp? I’ve found that 350F works pretty good as well. Love that you went with pecan wood. If you haven’t tried cherry wood with turkey, I highly recommend it. It really pairs well and will give your bird an outstanding color. Great post, thanks for sharing. 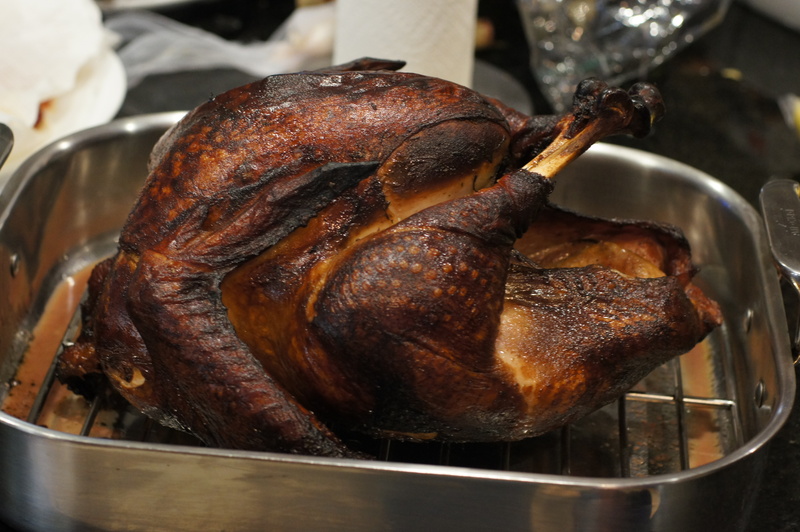 I’ve found that turkey takes up smoke pretty easily (and is way easy to overdo it). I try and keep my brisket, butts and ribs at 250F to give it time for the fat and collagen to break down, but turkey doesn’t really benefit from those low temps and will often result in rubbery skin. That’s just my humble opinion. Try it one day and let me know how it turns out. What kind of smoker are you using? I have a smoker made by David Klose, Klose Mfg in Houston. Bought it a the State Fair 20 yrs ago. It’s 1/4″ downhole drilling pipe, 36″ diameter, 2′ fire box and 3′ smoking chamber. I agree with you on temps and that at 250F and below, skin on turkey/chicken/poultry gets rubbery/tough. 275 – 300 F does a nice job on the skin as long as you have taken the appropriate steps to ensure crispy skin. Klose….very nice. Heard good things about them. Sure, but you would have to alter the smoking time. You might also try just the breast. Because it’s brined, it will stay moist. Also, if you look real hard you might find an 8 lb/4 kilo turkey. It always sounds like a lot of meat but the yield on a turkey is 45% after cooking, at best. This was a 9.5 lb turkey and it was gone in less than a week.